On Sunday, January 25, 2015 Duke University’s Head Men’s Basketball Coach, Mike Krzyzewski, better known to most of America as Coach ‘K’ made collegiate history by obtaining his 1,000 career victory as a head coach, when his Duke University defeated St. John’s University, 77-68. A husband, father, coach and I would declare a gentleman. Many across the nation would say they do not like Coach ‘K’, but those are the folks that he has routinely beat on the court. Sure if you have achieved the win total like Coach ‘K’ then several folks have lost to you along the way. Some of those probably have developed hard feelings because of those loses. However, no one can deny that Coach ‘K’ brings energy and a certain amount of electricity when he enters a room, whether it is a locker room or an enormous gymnasium. As a life-long member of the University of Kentucky’s Big Blue Nation, BBN, I remember the first time that I begin to understand the amount of class, dignity, and integrity that Coach Mike Krzyzewski possessed. On March 28, 1992 in the NCAA Tournament Elite Eight Round and the East Regional Final at the Spectrum in Philadelphia, PA. The University of Kentucky Wildcats and the Duke University Blue Devils squared off for a trip to the NCAA Final Four. 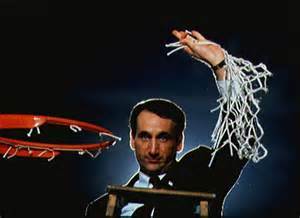 Coach “K” cutting down the net upon winning 1 of his many championships. The game was phenomenal and it could not have been better made for television programming. However, I did not listen to the television commentators that night, nor had I for any of the University of Kentucky’s NCAA tournament games that season. Every tournament game had the potential to be the final game on the radio for a legendary broadcaster, a legendary Kentuckian, and a legendary man, Cawood Ledford. So I put the television on mute and turned up the stereo to listen to the ‘Voice of the Wildcats’. Wow what a blessing and quite memorable evening! The game has gone down in the chronicles of college basketball lore as the ‘Greatest Game Ever Played’. It was a back and forth struggle, with excellent play and just enough drama. (Duke’s Christian Laettner stomped on Kentucky’s Aminu Timberlake and was not being ejected.) It being too great of a competition to end in forty minutes, the game went to overtime. In overtime, it took a remarkable last shot for Duke to win. With 2.1 seconds remaining, Bobby Hurley in-bounded the ball, going the 94-foot length of the court to Laettner throwing up a 17-foot jump shot to win at the buzzer, 104-103. The game was just one of Coach ‘K’s 1,000 (so far) wins, but it was the post game activity that won him my respect and the respect of many, even a few in the BBN. After the game amid all of the shock and disbelief that Kentucky had lost and the sheer emotional exhaustion, not to mention it really had become Cawood’s last game, the announcement came through the radio that Duke Head Coach Mike Krzyzewski had asked and received permission to address the BBN over the airwaves with Cawood Ledford. Coach ‘K’ shared with the University of Kentucky fan base the remarkable respect that he and the Duke University team had for the Wildcats and their then coach Rick Pitino. He spoke at how it was the greatest game he had ever been a part of and hoped that BBN could fully appreciate the effort that the team had put forth. Coach ‘K’ complemented the program, players, and fans and encouraged everyone to hold their heads high and be proud of the team, the University of Kentucky and the Commonwealth. I had never heard of any coach doing that before. Nor have I heard of it happening since. Coach ‘K’ is a College Basketball Hall of Fame Legend, but he is more legendary as a man than as a basketball coach. Congratulations Coach ‘K’ on your 1,000 victories! I especially like your team surrounding you wearing those hats with the Big Blue ‘K’ on them during the celebration. I hope it reminds you as it does me, that you couldn’t be the legend you are today without Kentucky!